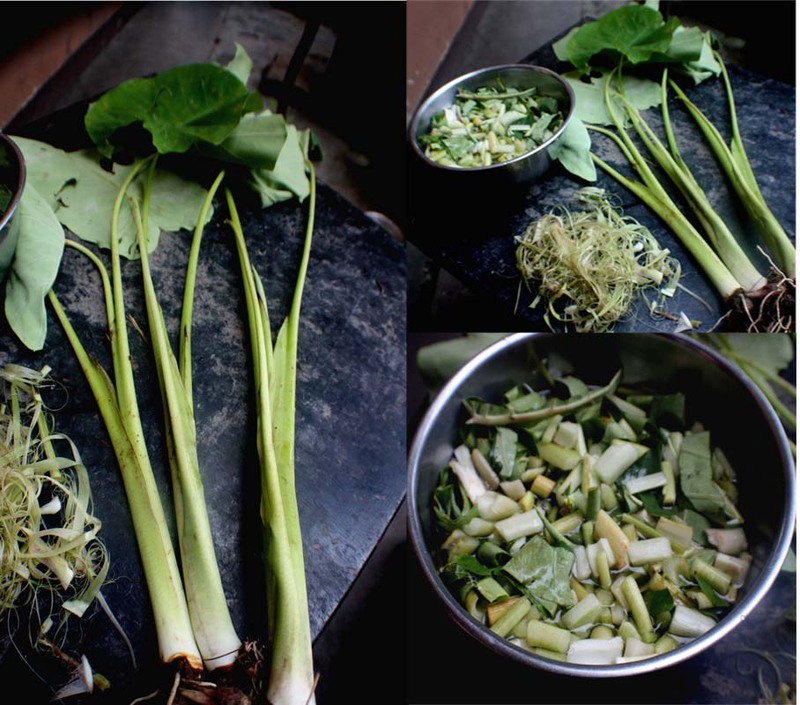 Cleaning Process : Separate the taro leaves and stems and rise thoroughly.Roll each leaf and chop it up. Bend each stem andpeel off the outer covering by pulling the fiber from all sides until you have smooth and silky stems. Cut them into medium size pieces and rinse them thoroughly again. When the stalks and leaves are cleaned, a sap is secreted by the stem and can cause a skin irritation and a temporary discoloration of fingers to some sensitive skin. To get rid of irritation, simply rub some salt or wear rubber gloves while cleaning. In a pan boil the water and add the taro leaves and stems. Cook until the leaves become like a paste ( In order to speed up the process, I pressure cooked the leaves and stems for 15 mins ). Add the ginger, turmeric and salt and cook till most of the water dries up and you have a nice thick consistency. In another pan heat the mustard oil and add the fenugreek seeds, Lovage (jwanu) seeds, red chillies, jimbu, hing and a pinch of turmeric powder. Heat for just couple of seconds and pour it over the taro leaves paste. Just before serving, add the lemon juice and mix well. Serve with rice. 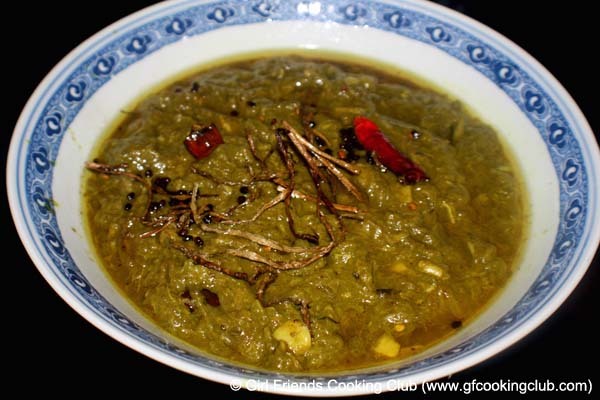 This entry was posted in Nepali Food Recipes, Vegetables and tagged Karkalo ko tarkari, Nepali Cuisine, Nepali Recipes by Kamakshi. Bookmark the permalink.